We have been receiving a few enquiries from our readers on whether their waste items can be recycled under the National Recycling Programme (NRP) or using the public recycling bins. They asked whether these items can be recycled – Yakult bottles, milk cartons, CDs, plastic packaging, shredded paper, spectacles, aluminium foil, styrofoam boxes, shoes, soft toys, pillows, clothing, food cans, stamps, magazines, etc. To be frank, we don’t have all the answers. To us, all items can be recycled technically. But whether the items actually get collected for recycling depends on the National Environment Agency (NEA), the recycling collectors and the market for the recyclables. Some collection companies do not collect certain items as there are only small quantities, whereas other items are not collected because there is no market for them. We think the best way to answer your enquiries is to start a new initiative called Can Recycle? If you’re not sure whether an item can be recycled, take a photo of the item (please try to keep each photo below 200 KB) and post the photo on our Facebook page. Write Can Recycle? in the title and a brief description of the item. We will consolidate the enquiries each month and check with NEA on whether the items can be recycled. We will also create a Can Recycle? section on our website, which serves as a database where you an check what items can be recycled. Next time when you’re wondering: Can Recycle? Remember to take a photo of the item and post it on Facebook. We will do our best to check and give you an answer. 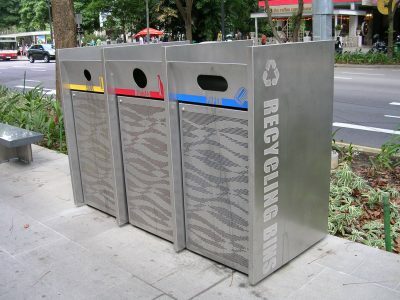 Did you know that there are more than 8,000 recycling bins in residential estates all over Singapore? Do you know where they’re located? If you’re trying to find a recycling bin near your house, the OneMap by the Singapore Land Authority shows the locations of public recycling bins at housing estates in Singapore. Check out the recycling bins map now! The participation rate in the National Recycling Programme (NRP) has increased from 15% in 2001 to 63% in 2008. Since 2007, there are 1,600 centralized recycling bins at HDB estates and one for every five blocks of HDB flats. The average amount of recyclables collected from each set of bins increased from 65 kg per month in 2007 to 103 kg per month for 2008. 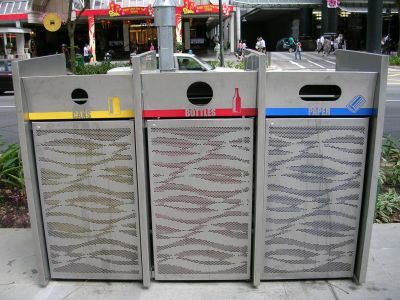 NEA targets to achieve full implementation for the mandatory provision of recycling receptacles in condominium and private apartments by the end of 2009. 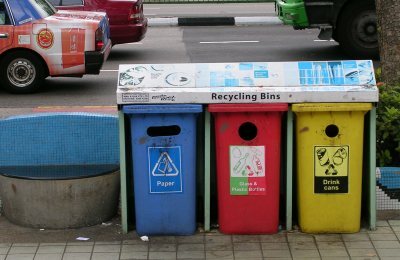 Singapore’s recycling rate has improved from 40% in 2000 to 56% in 2008 and we are on track to meet the Singapore Green Plan 2012 target of 60%. NEA will be launching a $8 million 3R Fund to co-fund new waste minimisation and recycling projects. The fund will co-fund up to 80% of qualifying costs and subject to a cap of $1 million per project. We are aware that some developed countries have used legislation to mandate recycling. In view of the current economic downturn, we are not looking at introducing legislation in the near future as it would likely increase costs for businesses and households. However, in the longer term, we will study the use of legislation to further improve our recycling rate. The Ministry is developing a plan to turn Semakau landfill into an Eco Park, where companies can conduct field testing of renewable and clean technologies. 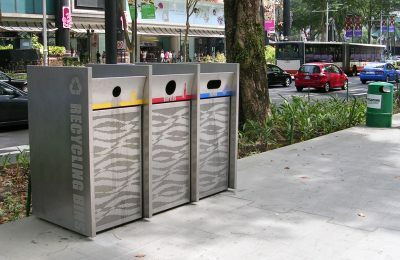 The old recycling bins have been placed at various locations along Orchard Road for about seven years, and are prone to pilferage and vandalism. With the new recycling bins, the locked bins and small opening makes it difficult for people to pilfer the recyclables. 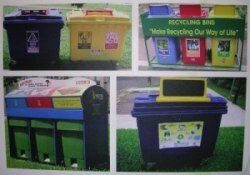 Some pictures of the new recycling bin are shown below. Keep a lookout for the bins next time you are at Orchard Road and remember to use them if you have paper, cans and bottles to recycle.